“We’ve seen it coming for 20 years,” said retired pastor Fred Heese, who still resides in the community. According to congregational chair Marvin Wiens, Emmaus had around 40 members, but only about 25 people attended regularly. In winter, with snowbirds gone to warmer climes, the number dwindled to 12. And, like many small, rural congregations, it had an aging demographic, with most members in their 60s and 70s. “We’ve all worked hard together to help our little world go around, but we don’t have the energy to keep it going,” said Lorna. Reduced finances also contributed to the decision. In the early 2000s, a significant gift from a non-resident family member enabled the congregation to hire a part-time pastor. Ray and Sylvia Friesen shared one part-time position, serving the congregation from 2004 to this year. Sale of the church manse some years ago provided the congregation with a reserve fund. But as membership decreased, the remaining congregants found it increasingly difficult to meet budget. They began using the reserve fund to balance the budget, but they knew the money would soon run out. 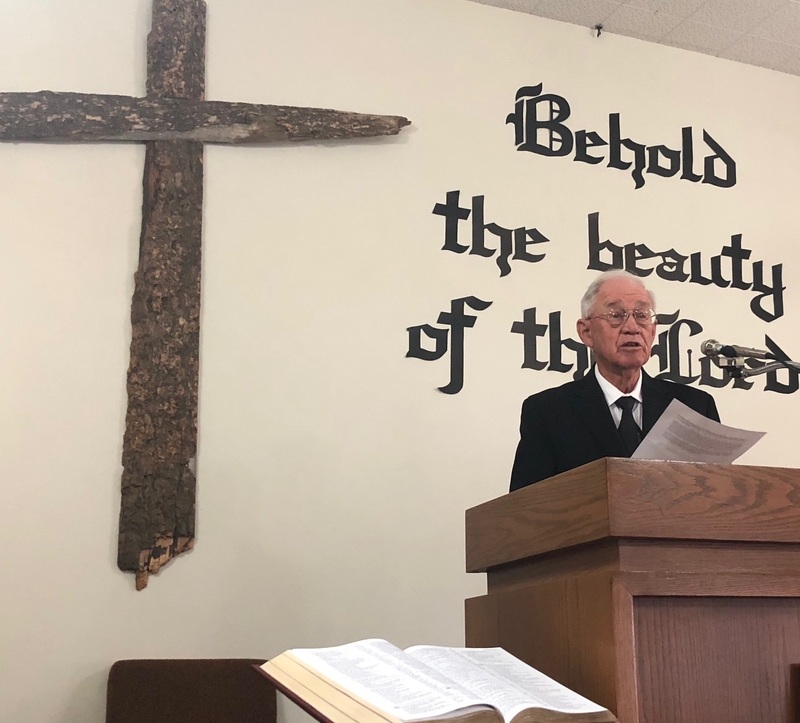 The congregation voted to close on May 20, but the actual closing service took place on Oct. 28, 2018. Upwards of 80 people gathered for a time of worship, fellowship and reminiscing. Many former members reflected on what Emmaus Mennonite had meant to them in their formative years. During the service, Heese shared the congregation’s history, which goes back more than 90 years. Mennonites from Manitoba began settling the area south of Swift Current, Sask., in 1905. In 1913, the Conference of Mennonites in Canada appointed Benjamin Ewert, from Drake, Sask., to serve as an itinerant minister to these scattered communities. But it was not until 1928 that 75 charter members founded Emmaus Mennonite. Originally, the church was a group of congregations, known as a Gemeinde. Congregations in Neville, Swift Current, Blumenhof, Schoenfeld, Rhineland and Wymark were collectively known as Emmaus Mennonite Church. 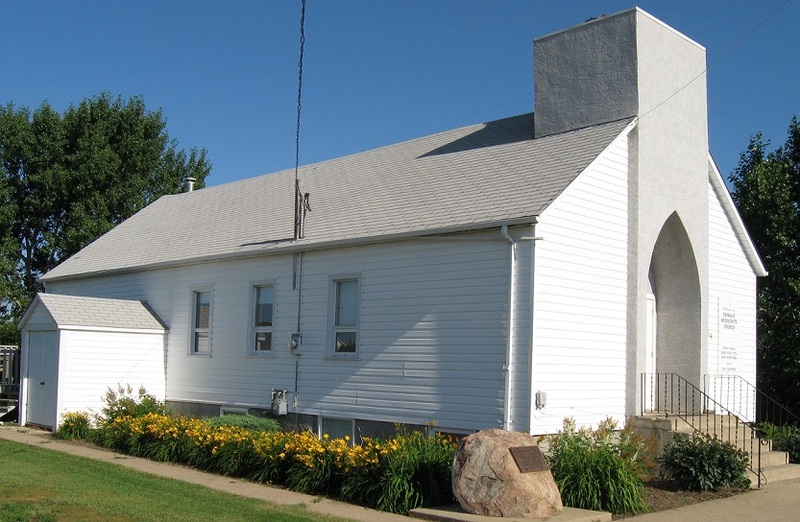 During the 1930s, the Gemeinde hosted evangelistic services in the Wymark community hall. A young couple, Valentine and Rosemary Nickel, who were teachers at the Wymark School, became Christians because of these services. The Nickels soon became active in Emmaus Mennonite, spearheading the search for a permanent place of worship for the Wymark group. In 1937, they found a suitable building in a nearby village, moved it to Wymark and renovated it. That building has served the congregation ever since. The Wymark congregation appreciated Nickel’s leadership and elected him minister. Eventually he became elder with responsibility for other congregations in the Gemeinde. Some of the outlying congregations closed once better roads made it easy for members to travel to Wymark. Some joined other Mennonite groups, such as the Evangelical Mennonite Mission Church or the Evangelical Mennonite Brethren. In 1959, there were 270 members in the Gemeinde, and congregants decided to form two distinct churches. The Swift Current congregation initially became known as First Mennonite Church, but changed its name in 1961 to Zion Mennonite. The Wymark congregation kept the Emmaus name. Emmaus Mennonite had 40 members in 1962 and peaked at 77 in 1990. By 2000, it had declined to 51 members. For many years, Emmaus Mennonite was actively involved in mission and outreach in the local area. Through the Saskatchewan Mennonite Youth Organization, Emmaus members helped found the Herbert Nursing Home and the Mennonite Youth Farm at Rosthern. 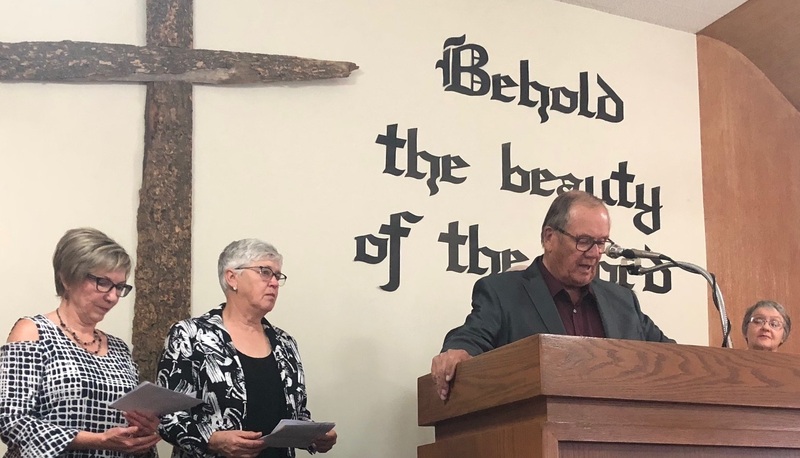 Under Nickel’s leadership, they purchased property on Lac Pelletier, south of Swift Current, which became Camp Elim, one of Mennonite Church Saskatchewan’s three camps. Emmaus Mennonite also helped establish and support Swift Current Bible Institute. Now that the church has closed, some members will be attending Zion Mennonite in Swift Current, a 23-kilometre drive north of Wymark. Some may attend other churches in the community, while others will likely quit attending church. For the time being, Emmaus still has a presence in Wymark. Members continue to be involved in a regular coffee time at the local skating rink. The group includes six to eight Emmaus people, along with others from the community. “There’s a lot of love in that group,” said Marvin.